Despite the fact that just last week we were in the dead of winter, this weekend it's been lovely and warm. It's even been warm enough to open some windows. My furbabies were very excited about that, and they decided to show that off for this week's Sunday Selfie blog hop, hosted by our furiends over at The Cat on My Head. Happy Sunday, everybuddy! We hope others are enjoying some warm weather like us! Just like humans, our pets need sunlight and vitamin D to thrive. Vitamin D deficiency can lead to bone and dental disease, and it can negatively affect the immune, cardiovascular, and a number of other systems in the body. So, make sure your pets are getting plenty of sunshine. Walk your dogs, and be sure that your dogs and cats have plenty of access to windows. Cats especially benefit from (and enjoy!) having window perches. Soak up that sun! 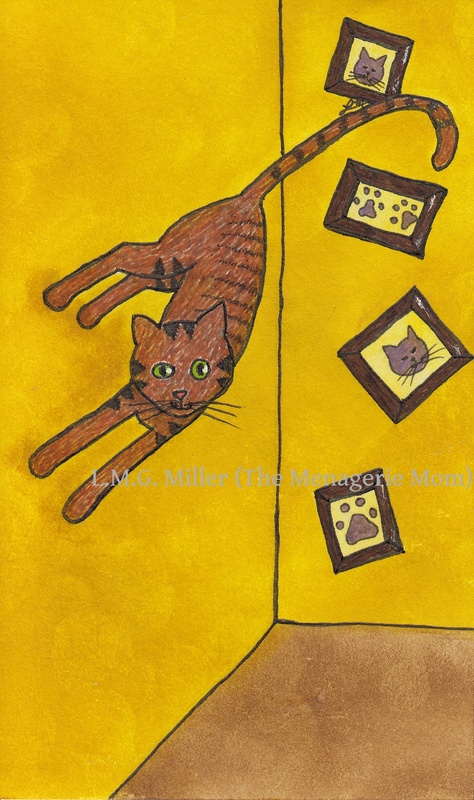 Last Caturday I was unable to share the next piece in my goofy series starring the furbabies in my life because, well, I simply hadn't finished it. That's not the case this time around, though. 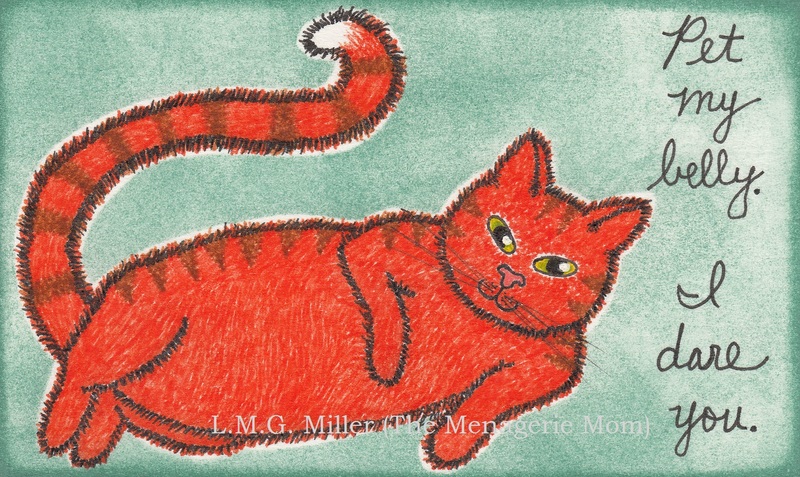 So, for this week's Caturday Art blog hop, hosted by Athena Cat Goddess Wise Kitty, I'm sharing a fun yet not all that untrue drawing of my girl Eddy. Wishing all of our furiends a wonderful weekend! You can get creative and make your own cheap treat-dispensing cat toy using a plastic Easter egg. All you have to do is cut a small hole in the plastic egg and then fill it with treats. This is a simple, easy, and cheap way to give your kitty a puzzle of a toy with a nice little reward inside. On this past Mancat Monday, I showed you how pretty my boy Evan is in pink. Remember? Foot stools in my house are not just foot stools. Rather, they're strategically placed stepping stools for Evan. Evan may not be able to jump, but that doesn't mean he can't climb. His upper body strength is quite impressive, and he can pull himself up onto stools and then onto furniture like a pro. ***EDIT II: Finally, below is the short and simple video I've been trying to share with you all day. It shows Evan pulling himself up onto a stool beside my bed. Evan loves to snuggle with me at night, and this is how he climbs into bed. Well, it's finally Friday, furiends! Are you ready for the weekend? Today's tip is simple and has probably already made itself evident in this post...If you have an aging, arthritic, or in some way special needs animal that is unable to jump up onto furniture, provide steps for him or her. This can be done easily by strategically placing stools, boxes, low chairs, or other similarly makeshift steps beside furniture. There are also pet steps and ramps specifically made and sold for this exact purpose. It may take some experimentation, as some animals may have pickier preferences for what types of surfaces they feel safe using as steps. But, with time and patience, you can find a system that works for your aging, arthritic, or special needs animal. Pardon my slightly biased doting, but I sort of think that my girl Thimble is sweet as sugar and cute as a button. And so, I'm dedicating this Thursday to Thimble. Thimble is the perfect little model, always with such ladylike poses. And she's always so focused on her photo shoots, never letting any distractions draw her attention away from the camera. And she always wears such a happy expression on her face. Most importantly, Thimble is honestly just ridiculously adorable. Have your window screens suffered at the paws of your furbabies (or clingy neighbor kitties like mine)? Try screen repair tape. Wipe down and dry off the areas around any tears in the screen, and then apply the repair tape over the damage. With kitty claws and puppy paws, screen damage is often inevitable, so try out some screen repair tape, and if you like it, be sure to keep it on hand! Astrid really knows how to work those puppy dog eyes. Even when she's got the perfect window seat, Astrid puts on those puppy dog eyes for the world to see. Don't let her fool you, though. She'll work those puppy dog eyes even when her food bowl is full, when her tummy is happy and full with peanut butter and treats, when her toys are all out and ready to play, and when there are plenty of kitties and humans available to cuddle on demand. What? Don't look at me like that, Astrid. I speak the truth. Wishing all of our furiends a happy Wednesday! For healthy treats for your dog (or cat, if they'll accept them), go all natural and see if your pup likes fruits such as bananas and apples, or vegetables like carrots and spinach. Especially for a picky eater, you can even try mashing, baking, steaming, or trying other ways of preparing health food treats. Of course, though, still only give these treats in moderation, and always be sure to monitor for allergic reactions and digestive issues when giving your dog new foods. And as for healthy human foods to not give your dog? Never give your dog grapes or raisins, as they contain components highly toxic to dogs. Likewise, never feed your dog onion or garlic. Those of you who know my girl Eddy know that she likes to give me a hard time during our photo shoots. She treats sitting still like it's the plague. Most of my pictures of her are blurry, and some are just really really really blurry. I should have named her The Flash. So what if her ears got cut off? I consider any non-blurry picture of Eddy a win. What's more, I love getting shots of Eddy from her right side. This is because my special girl has a head tilt to the right and right-sided facial nerve paralysis, and I love catching these special traits in photos of her. Today's tip is quick and easy...If your cat blinks slowly at you, it's a sign of contentment and love. In other words, your kitty is kissing you with his or her eyes. So, be sure to blink slowly at your kitty to tell him or her that you love them back! I think I mentioned quite a while back how I got a pretty pink cat bed with my girl Thimble in mind. The truth, however, is that Thimble hardly even touches the bed. That doesn't mean it doesn't get used, though. Why's that? Because my boy Evan loves the pink bed! Evan sure is pretty in pink, and he knows it. Have a great Monday, everybuddy! Sufficient water intake is very important in a cat's diet. In the wild, cats are carnivores, which means their diet of animal meat is heavily consistent of water. That's why, especially when fed primarily dry diets, our kitties may be prone to urinary tract health issues, especially those lumped into what's called FLUTD (feline lower urinary tract disease). Because of their particular urinary tract anatomy, male cats are especially prone to urinary blockages. Therefore, it's in large part for the purpose of promoting urinary tract health that sufficient moisture in their diet is very beneficial to cats. So, be sure that your kitty always has a bowl of fresh water. What's more, moist food is a great addition to a cat's diet (of course food portions and kitty's weight should always be monitored). Yesterday, my family had a long day of traveling and family visits. My sister and I took our pup Astrid along with us, as both she and we prefer that over leaving her at home. Now, Astrid is beat. We hope all of our friends and furiends out there have a wonderful Sunday! For all you affected by the snow storm, stay safe, sound, and warm! Don't forget the simple yet very important necessity of giving your cat or dog daily verbal and physical interaction. Cats and dogs want and need to feel secure, content, and loved by their people, so be sure to that your cat or dog is truly getting daily verbal and physical interaction. What's more, be sure that at least a few minutes of said daily interaction is one-on-one attention for each of your furbabies. Take the time to tell them that they're a good kitty or doggie, and to pet them and cuddle on them and play with them. Our schedules can be crazy, yes, but even just a few minutes a day of such interaction is important for a happy furbaby. And, of course, there are great mental and health benefits for us humans when we love on our furbabies. So, cuddle away! 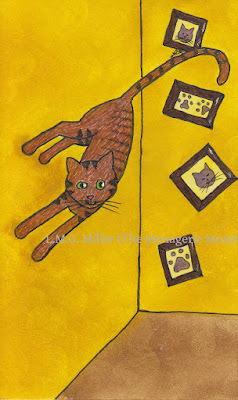 Today I wanted to share the next drawing in my goofy art series starring the furbabies in my life. This next piece stars my active girl Eddy. However, for me this was one of those weeks where life just sort of makes plans for you without consulting you first. In other words, the art I wanted to share today didn't get completed. However, I flipped through some of my slightly older art, and I found one that I don't think I've shared with you before. 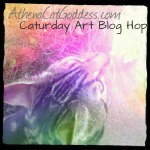 So, although it's a change of plan, I still have something to share with you for this week's Caturday Art blog hop, hosted by Athena Cat Goddess Wise Kitty! I think we all know a kitty or two who rolls up that adorably floofy tummy, and so of course we take the irresistible bait, and then we find out that it was all a trap. My boy Evan is my snuggle buddy of a momma's boy, but he nevertheless has been known to throw out that belly bait, and I always fall for it. A couple days ago I mentioned giving your cat variety by occasionally relocating their sleeping spots. One commenter further noted offering variety by doing the same thing with their toys - moving toys around throughout the house can give our pets new, fun experiences that keep them occupied. (Thanks for the great suggestion, Marg!) Similarly, you can offer your pets some much needed variety simply by rotating through their toys. In other words, don't put all of your pet's toys out in circulation at one time, but instead always have some held in reserve. Have a secret toy box, and on occasion give them some of the toys hidden in there while also retiring recently used toys to it. Even if an animal has played with a toy before, if it's been hidden away for awhile, it'll be like new! Our pets need variety like this, otherwise they run the risk of becoming bored with their day-to-day life. Happy Friday, everybuddy! We hope all of our furiends and friends on the East Coast are stocked up and getting all safe and sound for the snow storm coming your way. For a nail trimming session with the least amount of wiggles as possible, try doing it when your cat or dog is very relaxed or snoozing. Keep a pair of nail trimmers near one of their sleeping spots. If your cat or dog likes to snooze next to you on the couch while you watch TV, keep nail trimmers there. Of course, don't alarm your cat or dog by suddenly grabbing your sleeping pet's foot and cutting away, but pet them a little first, and then slowly start trimming. If after a few claws your animal starts to squirm, stop. Sometimes you have to break nail trimming up in into a few sessions so that your pet doesn't become stressed. That's fine, because you don't want your pet to start becoming suspicious of your or to start associating nap time with nail trimming. Also, don't forget that after a job well done, a reward of treats is always appreciated by your furbaby! Someone loves to play peek-a-boo. How's the weather up there, Thimble? Give your cat some variety. Like us, cats can get bored if their day-to-day life is the same, well, day to day. One easy way of giving your cat variety is to offer them different places to sleep. Regularly create new sleeping spots for your cat by putting one of their favorite blankets or one of your shirts in different spots on different days. Of course, if your cat has one particular spot they prefer to sleep and moving that spot stresses them, leave that sleeping spot intact. But, you can still offer your kitty a change of scenery by setting up a variety of other new, different spots for your kitty to choose from. You can even create forts on a couch or bed using pillows and blankets - many cats love this! We got our first real snow of the season over the weekend. And we woke up this morning to find at least two more inches of the white stuff on the ground! If there are outdoor, stray, or feral cats in your area for which you'd like to provide shelter, especially in cold winter weather, you can easily and cheaply do this simply by using a Styrofoam cooler. Cut a hole in the side of the cooler so the cat can get inside, where it can find some insulated warmth. Blankets or towels are always an easy means of providing bedding. However, keep in mind that should the cloth get wet with rain or snow, the bedding is essentially rendered useless and the cat won't be able to stay dry and warm. Instead, consider placing a deep layer of straw in the shelter. Straw does not hold in moisture like cloth, and the animal can burrow down into it to stay warm. I love to photograph my furbabies, which means I certainly have plenty of outtake shots on hand. In fact, going through my recent photos, I found far more blurry, messy outtake shots than nice, clear shots. Let's be honest, though, that's just as much the fault of my lack of photography skills as it is the fault of my furbabies' boundless energy. Evan: Did someone say, "Cheese?" Evan: Wait, you didn't really mean it? There's no cheese? Are you sure? I thought I smelled cheese. Evan: Where's the cheese?!? I need my cheeeese!!! Eddy: Hey, big brother, you wanna play? I love to play. Evan: Play? No. I want cheese. You won't like me when I'm cheeseless. Eddy: Aaaaahhhh. I just wanted to play. The Mom: Are you two fighting? Yes? All right, just let me grab the camera. from Evan under this decrepit chair. Eddy: Or maybe I'll hide from him up here...Oh, no. Is he behind me? angel like always. Can I get some pictures of you? Thimble: Yay! The camera wrist strap is here! sneak up on it. It'll never see me coming. to remember my camera wrist strap by. you being all cute while using your scratching post? must be no photo evidence of this. Run! Astrid: What was that? Did I just hear a kitty run through? off with my beloved chew bone...Mmmm. Nom nom nom. chew bones to feel left out. Mmmm. Nom nom nom. Wait, is there someone creeping up behind me? up here on the kitchen counter. She'll never see me up here. shoot? How's this expression? Flattering, right? If your dog or cat tends to gulp down their food when fed from a bowl, try feeding them on a shallow plate instead. Food on a plate does not pile up like it does in a bowl, and therefore your dog or cat can't dig in so emphatically or take big mouthfuls. Alternatively, when feeding a dog or cat from a bowl, you can slow them down by placing a ball in the bowl with the food. The animal will have to eat around the ball (make sure it's a size that still allows the animal to get to the food), which will thereby slow down their eating. Of course, if using either of these methods, be sure to monitor that your furbaby isn't getting frustrated or discouraged by the measures being used. Do any of our furiends out there have a default snuggle pose or snuggle face like Evan does? If your cat likes milk, try yogurt as an alternative treat. Cats can be lactose intolerant, and since milk contains lactose, it can give cats some rather unwanted and uncomfortable symptoms. Yogurt is lower in lactose than milk since, in the process of manufacturing it, bacteria help to break down the lactose. What's more, yogurt contains probiotics that can offer intestinal health benefits even for cats. Plain, low-fat yogurt is often the best option as a treat for your feline furbaby. Of course, just as with any human food or treat, only offer your cat yogurt in moderation. If your kitty likes to join you at snack or mealtime, though, a little dollop of yogurt could make for a happy kitty. 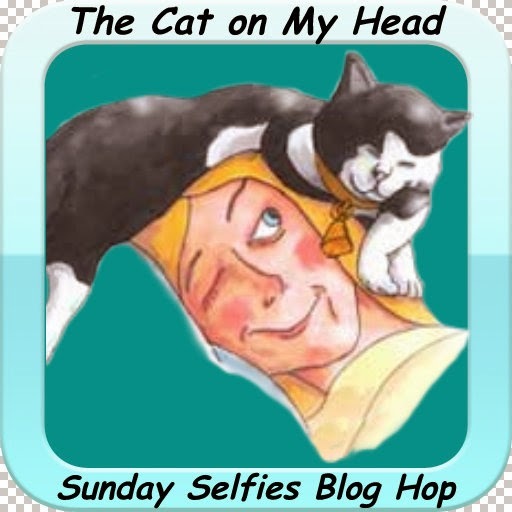 For today's Sunday Selfie blog hop, hosted by the pawesome The Cat on My Head, my furbabies and I had some fun experimenting with various techniques and poses. Of course, plenty of shenanigans ensued. After plenty of bloopers (which I will share in a future post), lively Astrid finally sat still long enough to snap this perspective shot. And my photogenic little lady Thimble also gave me another one of her perspective shots. Evan experimented with some focus techniques, and ended up with this shot of him barely visible over the foot of my bed. I call this his peeping tom pose. Our housemate Toby wanted to get a shot similar to Evan's, and he decided that atop the kitchen counter would be his photo shoot location. He was so excited that he could hardly sit still, and so this less than focused and far from centered photo was the winning shot. Eddy couldn't decide what technique or pose to go with, and she also couldn't decide whether or not she wanted to sit still or bounce off the walls. She ended with this shot, which, although blurry, shows off this special girl's winning snaggletoothed smile. I hope you all had just as much Sunday Selfie shenanigan fun as we did! Pets come with lots of unconditional love and cuddles. And they also come with lots of fur, including on our furniture and clothes. Fear not the fur, though. To remove fur from your clothing or furniture, you can make use of the adhesive nature of a lint roller or tape. Another option is to use a a rubber glove. With this method, all you need to do is put on a rubber glove and then drag your gloved hand across the fur-covered surface. The static created will help to gather up the hair off of the furniture or clothing and onto the glove instead. So cuddle on, and de-fur later. More fun with persepctive...and a foot update. Sunday Selfies: Rain, rain, go away. For everything there is a reason.